Alfred Rudolph Waud, “President Lincoln and Genl. Scott Reviewing Regiments,” Histories of the National Mall, accessed April 22, 2019, http://mallhistory.org/items/show/303. During the Civil War, Mall grounds were used to quarter troops and house a hospital for the wounded. Union soldiers frequently paraded in the vicinity. In this picture, President Abraham Lincoln and General Winfield Scott review a regiment of Union troops in 1861. 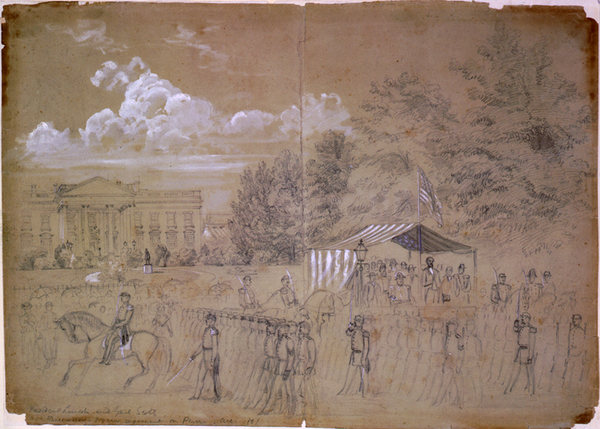 Lincoln stands before a flag pole, and Scott is shown sitting to Lincoln's right. The White House is clearly visible in the background. During the Civil War, the public relied on sketch artists to capture action. Alfred Waud, who drew this scene, became known for his accurate portrayal of events and his passion for portraying the realities of soldiers' lives.